This section explains how to restore Oracle databases and Oracle Data Guard back to the production environment. 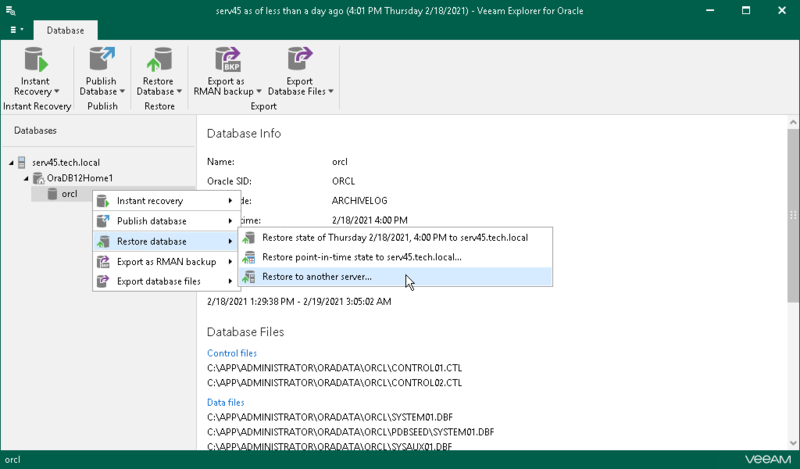 When restoring Data Guard to another server using the feature described in this section, the database from Data Guard will be recovered as a standalone Oracle database preserving no Data Guard infrastructure. To restore Data Guard infrastructure as a whole, use either a latest state restore, or point-in-time restore. For more information, see Restoring Latest State and Restoring Point-in-Time State respectively. In the navigation tree, select a database or Data Guard. On the Home tab, select Restore Database > Restore to another server or right-click a database or Data Guard and select Restore to another server.